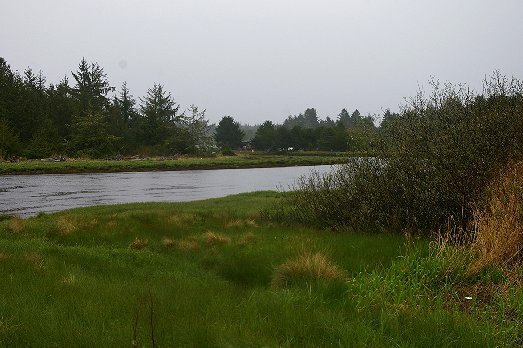 The town of Copalis is about a ten minute drive north of Ocean Shores. 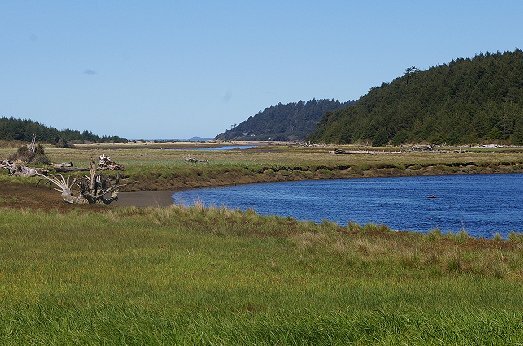 There's not much there, but a beautiful inlet, interesting driftwood, and the Green Lantern Tavern. We had never been to the Green Lantern, so it became a destination on this trip to the ocean. We headed out for lunch. We had only been on the road for a few minutes when I saw an old car following behind. It looked like a classic. I guessed a 1936 something . . . possibly a Chevrolet or a Buick. While I talked with "Dave," Peg was given a tour of the interior. The car was from Louisiana, where it was a Wedding Car. The seats were leather. The bride and groom sat in the back. There were bud vases on either side of the back seat, and a small raised platform for the happy couple's feet. 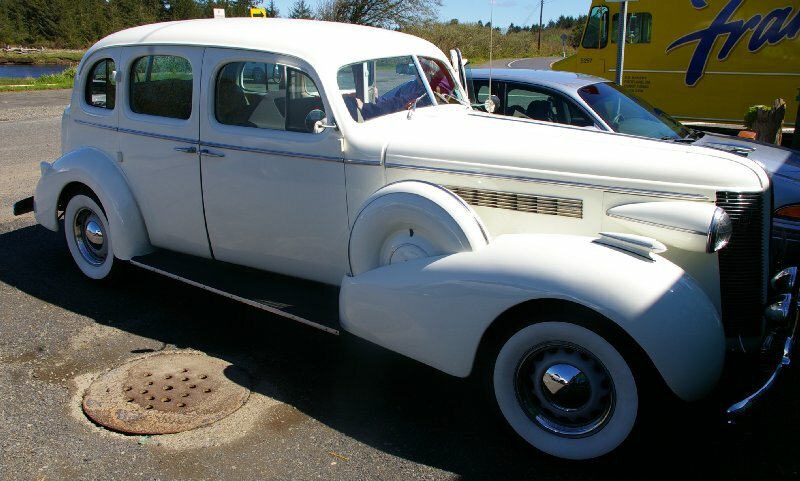 The Buick has a 350 engine, automatic transmission, disc brakes, and power steering. Dave bought the car as his complete bucket list after extensive surgery seven years ago. 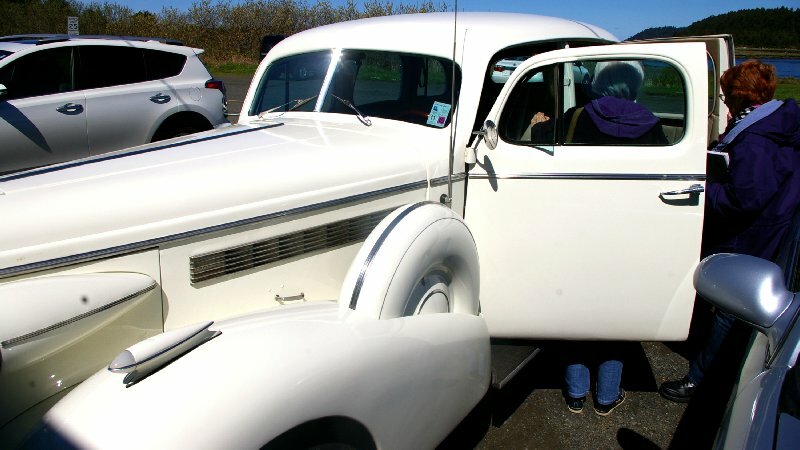 His gorgeous white Roadmaster has a personalized license plate of "MOBYDIC." I paid homage. Peg and I went inside and had a good clam chowder. In their recipe they used tarragon and dill. They used the same spices for their tarter sauce. Peg ordered the salmon Caesar, with the salmon slightly underdone. The salmon was perfect. Many restaurants end up over-cooking salmon, which is nearly a sin in our household. The service was good and the waitress, "Flo" was both friendly and helpful. The salad could have had a bit more dressing, but Peg didn't bother asking for more. 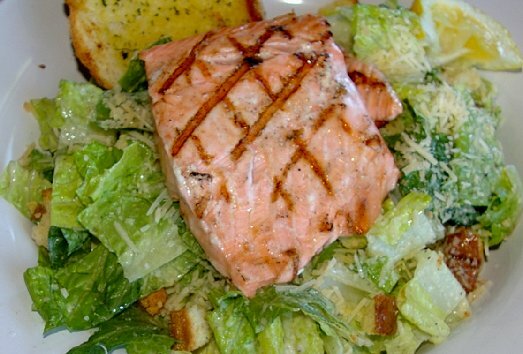 I had some of her salad (I would have asked for more dressing myself) and also enjoyed the salmon. The Green Lantern has a good following. The prices were decent and the food good, which is a great combination. I ordered the Seafood Platter with extra lemon and tarter sauce. The platter had a nice piece of fish, deep-fried oysters, clam strips, and two shrimp. I would have eaten the lunch without snacking on French fries except for the fact that lunch was served with a container of cocktail sauce. Cocktail sauce is just ketchup with horseradish, but I love that little bite of horseradish with my warm and perfectly cooked fries. I gave Peg one of my shrimp, a couple of my oysters, and a couple clam strips. This was excellent bar food. 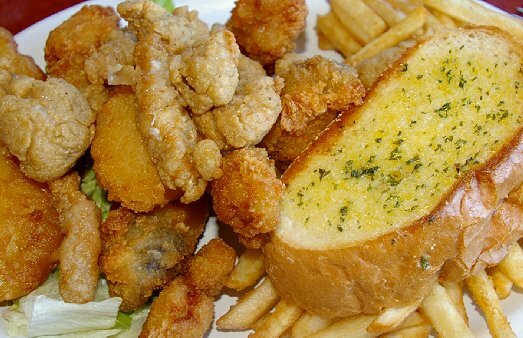 Clam strips are a rare occurance in most bars and restaurants. I like them because that are both crunchy and chewey. I told Flo I would be back for breakfast. I think that Harley riders also make The Green Lantern a destination. 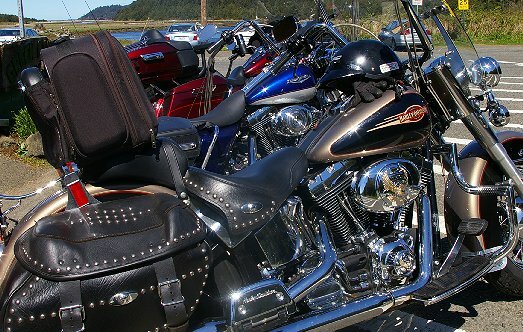 If you want to hit the open road and enjoy a good meal at the midway point, Copalis and The Green Lantern fit the bill. While we were eating, I saw riders come in and walk behind the bar and out the back door to the beer garden . . . and we never saw them, again. On a dismal day, this tavern might not be as popular, but on a glorious Friday probably only serious ill bikers didn't make the trek. We left in the early afternoon, but The Green Lantern has a Friday special of Prime Rib, so I bet the garden did good business that evening. After paying our bill we walked out to the beer garden. The beer garden is fenced. It's square footage is larger than most of the local homes. The are some covered areas, but mostly the garden is open to the elements. In the summertime, this must really be a going concern. The fence even has windows so jealous people on the outside can see the fun and merriment going on within the garden. 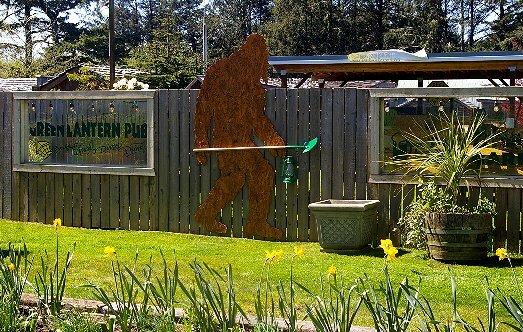 I loved the cut-out image of Sasquatch carrying a shovel on the side of the fence. The fence is a great idea, it offers privacy and taunts those who haven't made up their minds, yet that a good time is just out of reach. 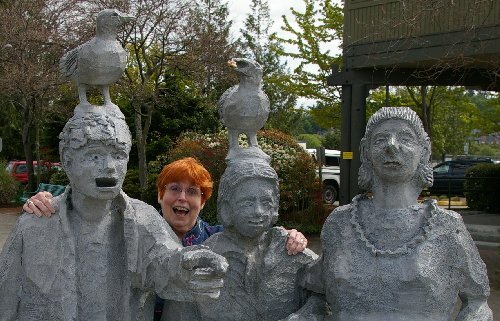 Years ago, Peg and our friend Andi Melquist came down to Ocean Shores on their own to get away from the kids and husbands. It worked. They relaxed for a couple of days and visited garage sales and art shows. Next to the beer garden is a group of tiny buildings where vendors used to sell their wares. Peg's favoring paring knife was purchased in one of the buildings. The Melquists and the Domans have been friends since the mid-70s. The two families would camp out together. Our kids grew up together and consequently our son Del married their daughter Johanna and sealed the deal with two granddaughters. Later before Andi passed away, one of her final wishes was for the two of them to go to Ocean Shores again. But there was no way. Andi needed help to get around and Peg wasn't strong enough to assist. Both were disappointed. The tiny buildings are still standing, but there are no more flea market vendors. I understand that the building will be torn down or sold. The waitress Flo would like to buy one, but the big expense is moving them. But they're not that big. I would think you could easily jack them up and build a skid underneath and wench the little cabins up onto a flatbed trailer. One of the larger ones might make a good get-a-way in the deep woods for living off the grid. If not, a play house for kids might easily be made out of the tiny buildings. A quaint tool shed could also be made . . . or a large dog house . . . a chicken or pigeon coop . . . a smoke house . . . OMG the possibilities are endless. I returned the next morning by myself. I ordered the chicken fried steak with extra gravy. 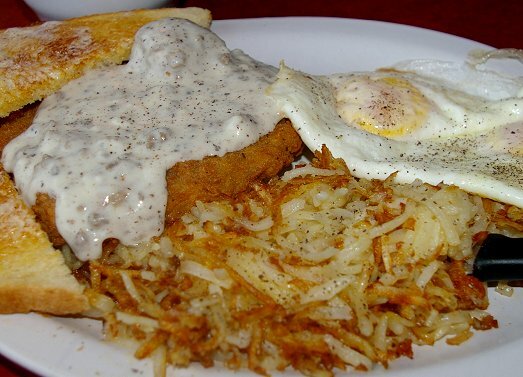 I loved the hash browns and medium eggs. They were absolutely perfect. The gravy was excellent over my left over potatoes and my sourdough toast. The chicken fried steak was disappointing, however. I'm guessing it was bought frozen. It was just a little too crusty. I prefer cheap round steak beaten to within an inch of its life and then cast iron skillet fried. As I ate I kept an eye out on the inlet. I saw a hawk or an eagle floating for ages before diving and taking off. It was a rainy, mist, foggy day. Inside there were only me and an older couple at the bar. I enjoyed talking with Flo. When I took a photo of Flo she proudly opened up her jacket to reveal a Lantern Lunch Program for the Kids sweatshirt. She is a great asset to the tavern. She's only been working there about a year. She has a sixteen month-old and lives in a transitional trailer while she tries to save money. She remembered that I said I would return and that's a good skill. Good waiters and waitresses are worth their weight. 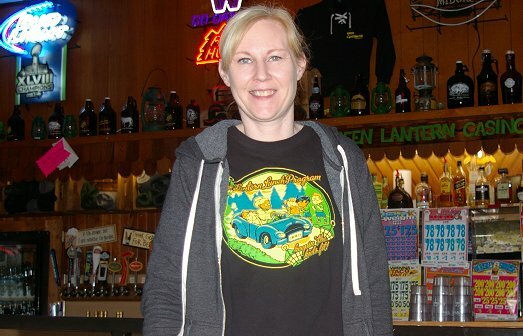 We have our favorite restaurants in Tacoma and the best ones are the ones who have support staff that recognize the good customers, but treats everyone like they could become a repeat customer. Shortly after taking this photograph I had to leave quickly, but I made sure I gave Flo a good tip. As I had been sitting and looking out the window, I had caught a glimpse of a row boat or a canoe heading upstream. I just saw it for a second before it disappeared behind the bushes on the bank. My imagination took over and I can't tell where memory and make believe met. Was it a racing skull? A small dragon boat? A kayak? Were there two people or three? Where was it going? Was it coming back? I waited a few minutes before scurrying out to my car. The inlet travels like a snake, which meant that the boat had to have taken some time to get where it passed out of sight. How could I have missed it. In my car I drove slowing on the road peeking over the bushes and through the trees looking for movement. I reached the long curving bridge that allowed me to see both up creek and down, but I saw nothing. I glanced down the road and saw an "open" sign flashing. I thought perhaps the rowers or paddlers had pulled the water craft out and put it into a truck or on to a roof. I drove by the coffee shop, but only two people were inside and they were at separate tables. 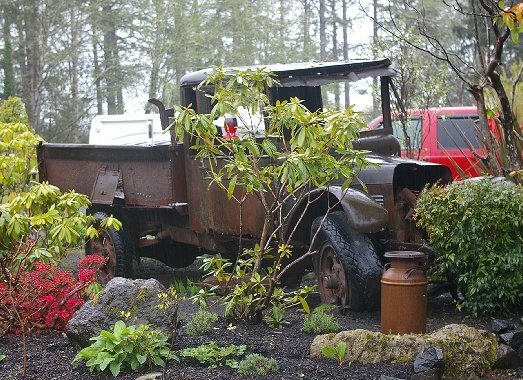 I saw couple of large "Expedition" style trucks and even an old rusting truck hulk that must have been a hundred years old. Perhaps I should have gotten out of my car and looked in the bed of the old hulk. I saw no boat sheds and saw no one walking around. Everything was damp or wet, so there were no foot prints to go on. How could they vanish? I drove back to the bridge and then took a road heading north in the direction of the creek. I stopped when I reached a "Private Property" sign. 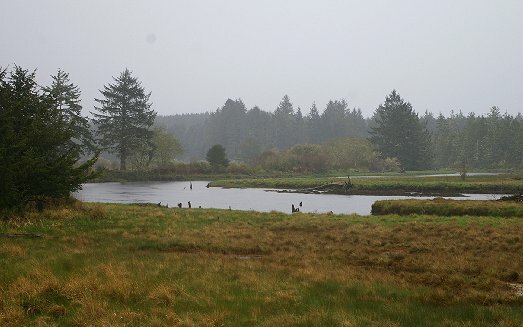 I went back to bridge and looked up and down on both banks and stared at the serpentine movement of the creek as it traveled through damp pastures. I asked Flo about rowing groups? Native American groups? Fishermen? Zip. Nada. I was left with nothing but a faltering memory and a healthy imagination. If only I had Peg with me and both of us were looking out the window. Oh, well. We'll be back to Ocean Shores AND The Green Lantern. 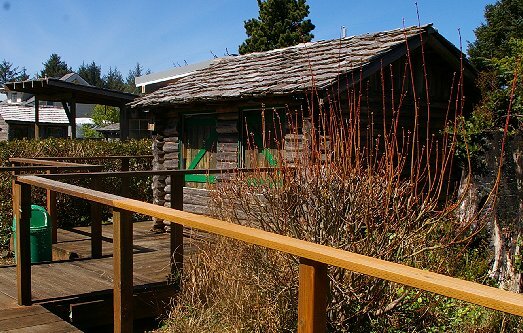 Green Lantern and Moby Dic Copalis, Green Lantern Restaurant Review - 2017, Ocean Shores, Green Lantern Restaurant Review Copalis, Green Lantern Restaurant Review Ocean Shores, Moby Dic white 1937 Buick Roadmaster, Green Lantern and Moby Dic - 2017 Copalis WA.